The last two nights of Bowling 2.0- T-Shirts and the Final Sweep by Socialtext. We had a great time videoblogging you all. Hopefully we’ll have a videoblog team on the league next time! Enjoy! See the Flash Version Here. The question “Why?” gets asked a lot. It’s a very good question, other then a shrug of the shoulders and a ‘why not’ response, bowling 2.0 grew out of a half joke between members of the meetro team. Being that meetro is social software that encourages people to meet in the real world, and we here at meetro are always looking for a good reason to throw a party, we were brainstorming some ideas of events to throw around silicon valley. There are too many events that are heavy on the professional and networking side, but not many events where people just hang out, drink a few beers, and trash talk the competition. We started tossing around ideas of competitive sports, but quickly threw that idea out as we figured most geeks aren’t too physical! Then a joke came out… “Why not bowling?” After we all had a few good laughs, we said, wait a minute, bowling would be kinda cool… After all, it’s a sport, it’s competitive, beer pitchers are of the plenty, and it’s completely ironic to have all these high tech companies hanging out in such a low-fi atmosphere. Half the bowling machines look like they were produced before the Atari was invented! So we thought about the idea a little more and decided we needed to make this happen. We reached out to a few companies and ppl really bit into it. 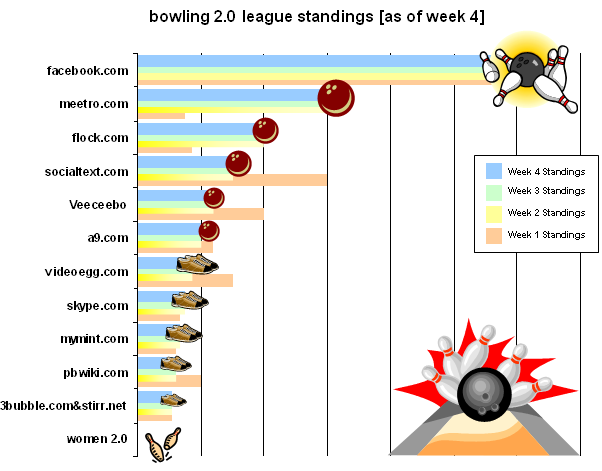 We started talking to bowling alleys to see what was required to start a league. 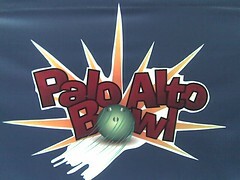 Heck, most of us here at meetro hadn’t bowled more then a dozen times in our life. For some, the last time they bowled was at a friends 6th grade birthday party. We sent out a few emails and everybody was really excited on the idea. So we reached out to a few more companies, and they were excited about the idea as well. 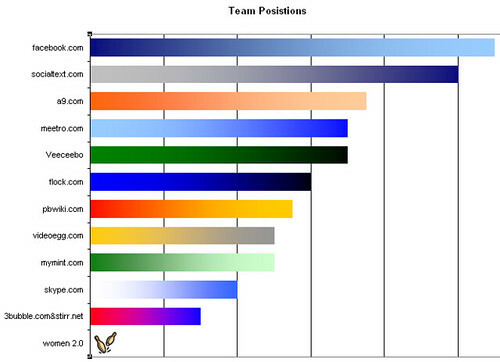 Then it was picked up on valleywag and interest exploded, we had to start turning companies away! As part of a podcast segment on Tea Time, they asked me a few questions along the lines of “What’s happin’” in sunny palo alto, tune in to some details on how bowling 2.0 got started. Or just make fun of my stutter on the segment intro. a9 takes the lead and veeceebo is trailing in 12th, you would think we ranked the teams alphabetically…..
Another name mistake takes the cake though, pbwiki’s name is displayed on the alley boards. 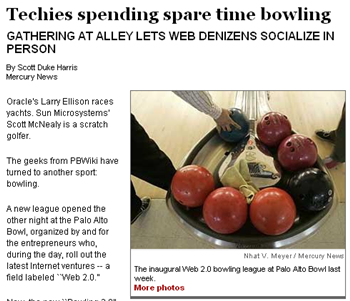 The alley mistook their company name for pbwili.com! There’s no domain there yet, but I have a few thoughts on an interesting web2.0 site that could fill pbwili with more then just P&B. 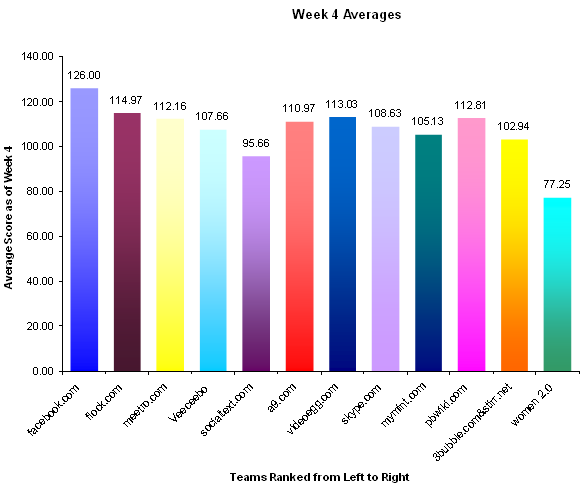 Ohh, and the stats from week #1 are up. I swung by the alley last Thursday to see if they had scores tallied up yet, but they were having some computer issues (it’s that old pre 1.0 technology.) I’ll be able to pick up last weeks scores tonight and post them here.